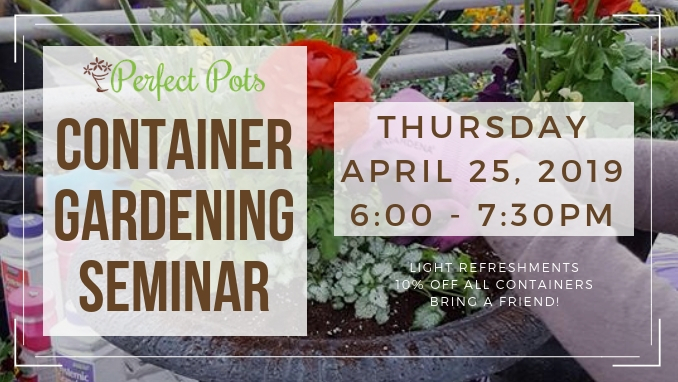 Join Perfect Pots’ Laura Lapp on Thursday, April 25 at 6pm to learn about creating and maintaining beautiful container gardens for your home. Laura will focus on creating gorgeous planters for both sunny areas and shaded areas. What plants are best? What’s the best soil to use? How to design and plant a container that remains beautiful all summer long? Laura will answer these questions and more. Seminar attendees can save 10% on all planters and urns. Light refreshments will be provided. We'd love to have you, but we want to know you're coming ahead of time.